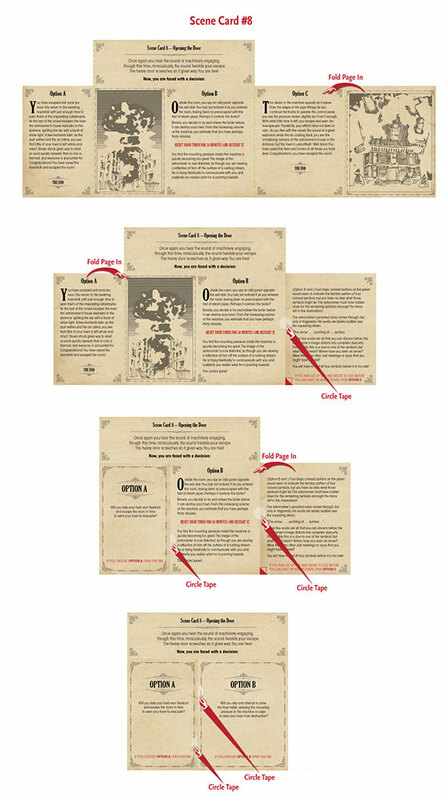 Follow the steps below to reassemble the game components after playing Mystery at the Stargazer’s Manor. Place the 6 Triangle Pieces, The Blueprint and Scene Card 4 back inside The Lock Box envelope. Reseal the envelope with circle tape (apply new tape if necessary). Place Scene Card 7 back inside The Steam Panel envelope. Reseal the envelope with circle tape (apply new tape if necessary). Place Scene Card 9 back inside The Control Panel envelope. Reseal the envelope with circle tape (apply new tape if necessary). Re-fold the Star Map along the fold lines. Place the Star Map and Scene Card 2 back inside The Dressing Table envelope. Reseal the envelope with circle tape (apply new tape if necessary). Re-stick the Portrait Card to the front of The Dressing Table envelope. Place the 7 Tangram Pieces, the Small Gear, the Steam Panel Dial, The Lock Box envelope (repacked and sealed) and Scene Card 3 back inside The Telescope envelope. Reseal the envelope with circle tape (apply new tape if necessary). Place the Gear Base, 2 Dowels, 3 Bookcase Strips, 8 Steam Pipe Pieces, and Scene Card 5 back inside The Filing Cabinet envelope. Reseal the envelope with circle tape (apply new tape if necessary). 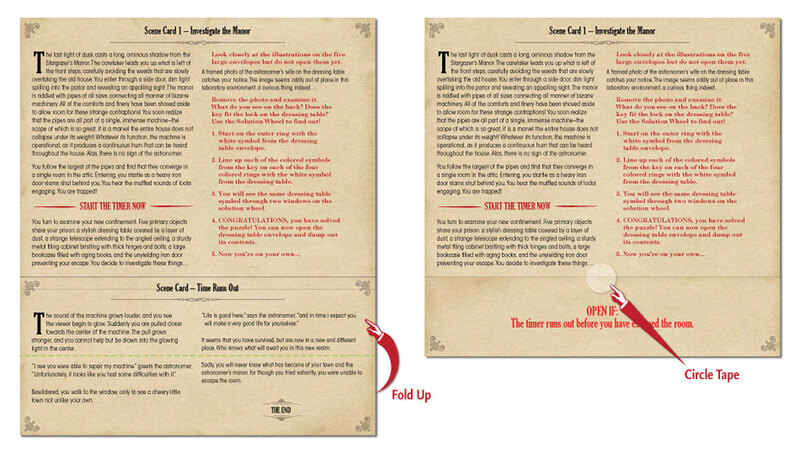 Place the World Viewer, The Steam Panel envelope (repacked and sealed), and Scene Card 6 back inside The Bookcase envelope. Reseal the envelope with circle tape (apply new tape if necessary). Fold in the sides of Scene Card 8 and re-seal with circle tape as shown (apply new tape if necessary). Place The Control Panel envelope (repacked and sealed) and Scene Card 8 back inside The Door envelope. Reseal the envelope with circle tape (apply new tape if necessary). Repack the instruction manual, Scene Card 1, the 5 large envelopes and the Solution Wheel back into the box as shown.